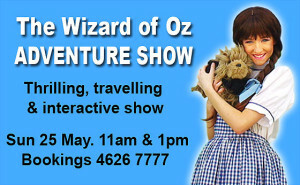 A magical, interactive & fun trip down the yellow brick road. Click link below to buy your ticket. Introduction to tableaux, expression & voice + Perform on stage with the Oz cast. New, interactive fun re-telling of Frank Baum’s classic story. There will be a Drama Workshop for children before the show from 9.30 to 10.30am. Click here for more details. Great school holiday opportunity for budding artists. Discover & develop drawing and painting skills in a creative environment with award winning artist Stanley Abnes. All material supplied. 6yrs & over. Very limited spots. Bookings: 46267777. Join the original yellow Wiggle Greg Page and his new friends from Butterscotch's Playground for a rip-roaring Christmas treat at Oz Funland. 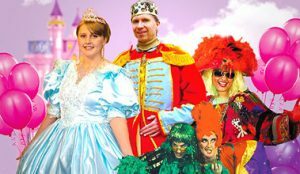 Then enjoy some interactive Christmas fun with The Oz Gang, Snow Queen and Santa.